The Saison style of Belgium was developed by the farmers of the Franco-Belgian countryside, and is often referred to as Farmhouse Ale. Prior to refrigeration, Saison would be brewed towards the end of winter, to be enjoyed during the laborious spring and summer months. As such, it had to be a strong and sturdy enough beer to last until and through those warm months, but still light and refreshing enough to be a thirst-quencher in summer. Saison Voisin is a marvelous example of the style—we almost wish it were more widely available so more people could try it—but then again, membership in our club has its privileges. 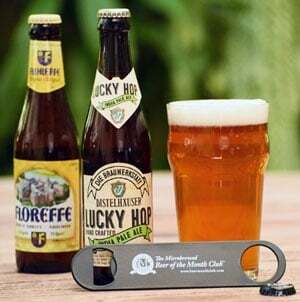 This beer would not have been available at all had the founders of the Giants' Brewery not purchased the recipes of the beers formerly brewed by the Voisin Brewery before going into business as their own brewery. The Voisin Brewery has roots as far back as 1877. The last owner was Léon Voisin, who took over the brewery in 1963 and ran it until its closure in 1989. Giants Brewery actually brewed their Saison Voisin under the guidance of Léon Voisin—now that's a good neighbor for ya ("voisin" actually translates to "neighbor" in French—quelle coïncidence?). So, this beer has some history and plenty of tradition to it, and we're glad to know it didn't become another beer lost to time. Saison Voisin pours a hazy reddish-orange color with an ample off-white head. On the nose are pleasant malt notes that lend a light caramel sweetness to the base of a very complex aroma. Look for a very distinct musty, hay-like grassiness to come over the top of the malt notes, along with impressive spicy notes hinting at pepper and cinnamon, with lightly herbal hops finishing it off. The complexity and aroma profile carries forward on the palate as it opens very crisp and dry, building into slightly sweeter malt notes on the midpalate. A light spiciness also presents itself right away and builds into the very prolonged finish. Along the way, there’s a light herbal hop quality along with a citric zing, and a very earthy, almost papery, character that merges with a note of sourdough bread crust all the way to the finish. We particularly enjoyed the spicy, zingy, and lightly bitter finish as it begged us to take another sip – again and again. An earthy Fontina or Camembert cheese would make a great pairing (either will bring out a nutty character in the beer), as well as Spicy Indian Samosas, or Larb (Laotian meat salad). The area around Ath, in the Wallonia region of Belgium, is known for more than simply its wonderful beer. Since medieval times, Ath has hosted an annual Parade of Giants known as “Ducasse”, in which “Gouyasse” (the local name for Goliath) leads other giant-sized figures through the streets, followed by brass bands, carnival floats, and throngs of normal-sized citizens in customary costumes. Not surprisingly, the local brewery, situated in a small town called Irchonwelz, is known as Brasserie des Géants (the Giants' Brewery). Brasserie des Géants not only crafts big beers to match their name, they have a rather large piece of real estate as well. The brewery is situated inside the 13th century Chateau d’Irchonwelz. Yep, they brew their beer in a medieval castle – talk about Old World tradition! The site offers an interesting union of quaint charm and impenetrable fortitude. And, they don’t hesitate to point out on their brewery tours that the gate at the entrance was purposefully built tall enough to allow the occasional giant to pop in for a quick pint (or perhaps keg?) of beer. The Giants’ Brewery was begun in 2000 by two young locals, Pierre Delcoigne and Vinciane Wergifosse, who built the brewery and operate it. With a background education in chemical and biochemical engineering, Pierre went on to graduate from the well-known Brewing Engineering program at the Louvain School of Brewing. In 1997, he and Vinciane acquired Castle Irchonwelz with the ambition of building their own brewery inside. After devoting two entire years to constructing and setting up the brewery, their first batch of “Gouyasse” went on sale in August of 2000. Known for incorporating the giants theme in their marketing, such as with the aforementioned Gouyasse as well as a black currant flavored brew cleverly called “Ducassis”, Brasserie des Géants recently acquired another brewery known for using local lore in the naming of its beers: Brasserie d’Ellezelloise, in nearby Ellezelle, Belgium. In d’Ellezelloise’s case, it was the witch Quintine, known in local legend to have been the protector of the hills around the region’s rolling countryside. Unified, the two breweries are known, not surprisingly, as Brasserie des Légendes. All of their beers are fit for giants and giant thirsts alike. But, in spite of their Giant name, Pierre and Vinciane brew only small batches of beer. 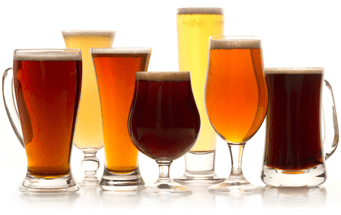 While some are certainly considered “big” beers with high ABVs, and all are big on flavor, they are all produced in low-volume and distributed in limited quantities. Ironically, in a world dominated by European brewing conglomerates, our friends at Géants are far more akin to David than Goliath. We wonder how they feel about their position in that battle, given their love of giants and all… but we’re pretty sure they feel a connection with both characters, as they’re a little guy in a world of giant brewers, as well as a colossus in the art of brewing.